Can Aries men and Capricorn women have a successful relationship that is compatible mentally, emotionally and sexually? By their astrology symbols alone, the Aries man and Capricorn woman should be perfect for each other. Every leader needs someone to follow, and when it comes to a relationship with an Aries man, a Capricorn woman at first glance seems to be the perfect fit. Where he is a take charge kind of person, she is more than willing to take orders from someone else. As a serial extrovert, the Aries man will be drawn to the Capricorn woman, who can be painfully shy, which he will read as mysterious. Her ability to remain quiet and alone will intrigue him, while his brash and bold behavior will amaze her. At first, these qualities will balance each other. His Fire sign will draw her out of her shell, while her Earth sign will ground him, keeping him flying off at the handle. Both the Aries and Capricorn will admire the other’s drive for success, despite their different paths towards their goals. As hard as the Ram works, he is also prone to taking giant risks. At the end of the day, he will exchange working hard for playing hard. The Goat prefers a more methodical approach, following the rules to achieve the best results. Then she would prefer to head home for some rest, or a little more research on future projects. That is where the Aries male can be most useful, by showing the Capricorn female how to have fun. The thrill of the hunt will excite both the Aries man and Capricorn lady. The Ram will stop at nothing to win the woman he finds attractive. He will shower her with gifts and grand gestures. These extravagant measures will surprise the Goat, who is not used to the high level of energy. The experience may intoxicate her, and force her to step out of her comfort zone. While the wooing process takes place, the Aries Capricorn love compatibility will grow. The trouble comes once the new relationship moves into a new stage. The Aries man is ruled by Mars, making him a fiery, free spirit. He may become bored by what he misconceives as a stagnant relationship. Aries men long to live new experiences. For the Capricorn woman, this so-called ’stagnant relationship’ is where she feels the safest. She prefers to spend time at home with her lover, in hopes of truly getting to know him. Capricorn women will live up to their relationship responsibilities, because that is what is expected of them. If the Ram crosses his woman, he will quickly experience her stubborn nature. Nothing short of a miracle will make her budge. He will need to borrow some of her grounding and sense of responsibility. She will need to learn to let go and experience life a little more. With the Ram taking the lead and the Goat taking care of detail work, there is no reason why the Aries man Capricorn woman can’t find love compatibility and reach new heights. Aries is a fire sign that is cardinal and Capricorn is an earth sign that is cardinal by nature. 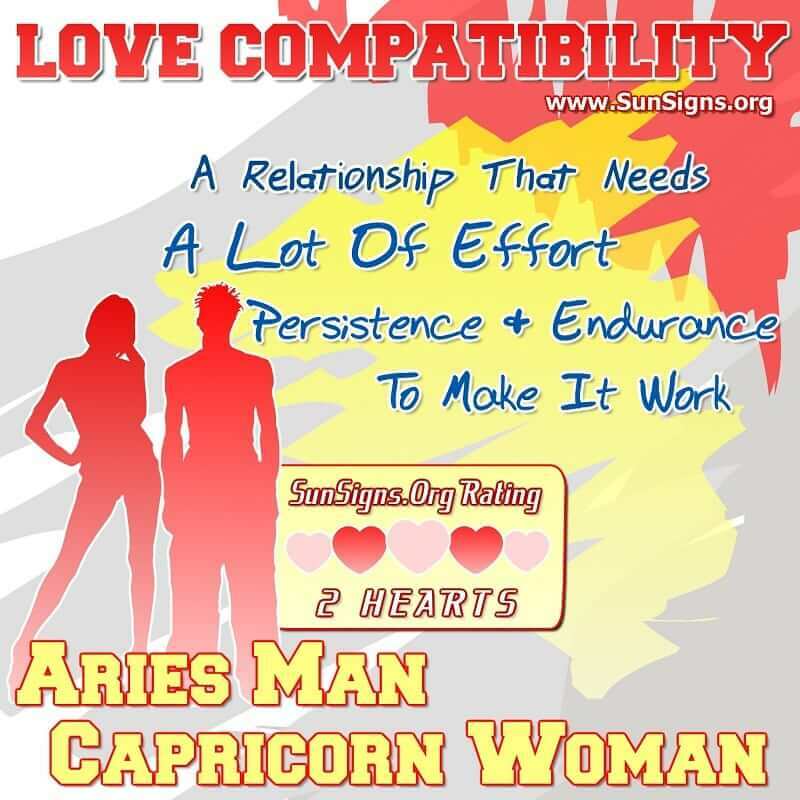 The Aries man Capricorn woman compatibility gets a TWO Hearts love rating. The key to love compatibility between an Aries man and Capricorn woman is learning from each other.